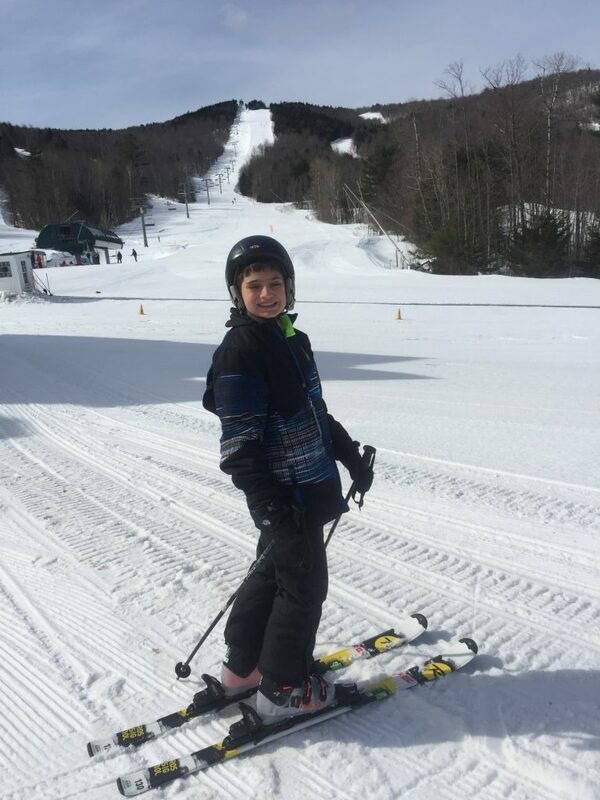 Our family lives in Northern New England, so we have lots of ski slopes very close by our house. 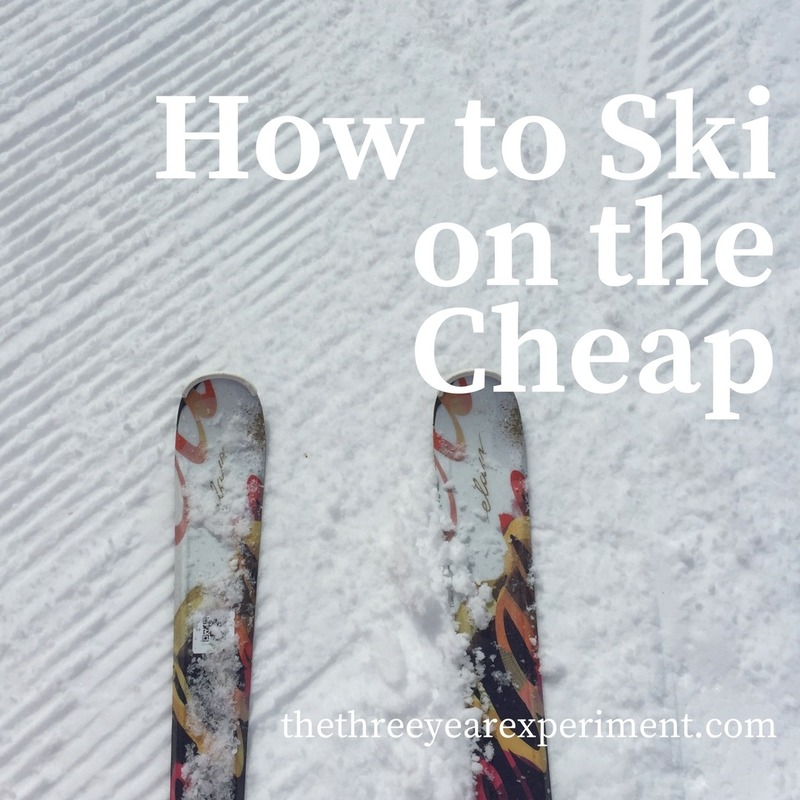 Unfortunately, skiing is very expensive and can work against our ability to save, so if we want to ski, we have to be smart about it. There are lots of secondhand shops in my area of New Hampshire, and they sell lightly used ski bibs, boots, and gloves. They also sell skis and ski boots. I’ve gotten my boys skis like this several years in a row. When the older one outgrows the ski boots, they’ll fit the younger one. I realize that if you don’t live in a “skiing” state, the chances of you finding this kind of gear are slim, but for us, this is a wonderful way to save on gear. We’ve gotten used boots and skis for around $10 per person. They do have to be tuned up and fitted, but there are local ski shops in our area that often offer one free tune up per year, if we plan ahead. This is my favorite way to acquire ski gear and a major way we outfit our kids in general. I have let my friends and neighbors know I would love to accept any and all hand-me-downs they have, and so I have a network of about 3-4 people who will give me their older kids’ outgrown boots, ski bibs, jackets, and gloves. I never say no to anything they bring me. If we don’t need it, or can’t use it, then I’ll donate it to a local charity that could. These guys know they can drop a bag off anytime on my porch and I am thrilled to accept it! This means that both of my boys were outfitted in snow pants, jackets, boots, and gloves for free this year! I also recognize how fortunate we are to have friends who are willing to pass their gear on to someone else instead of sell it. I think the key is to let people know you’d love to have hand-me-downs and also to accept any and all donations. We’ve talked about how to get “hardware” (skis and ski boots) and “software” (snow pants, jackets, and gloves) for cheap, but how about lift tickets? Lift tickets are the notoriously pricey part of skiing, and for us, the hardest to find deals for. But we’ve figured out a couple of tricks for getting the cost down. The first tip is to take advantage of local, smaller mountains in the area. We have a local mountain about 15 minutes from our house. They have several deals. They offer a $30 Season Pass for third graders. Last year, my son skied all season for $30! For me, they have a $20 lift ticket for the last two hours of the day. Children under 6 can ski free on the Learning Area, so we could use the mountain to teach our youngest to ski, and then I could help him (without skiing) for free. 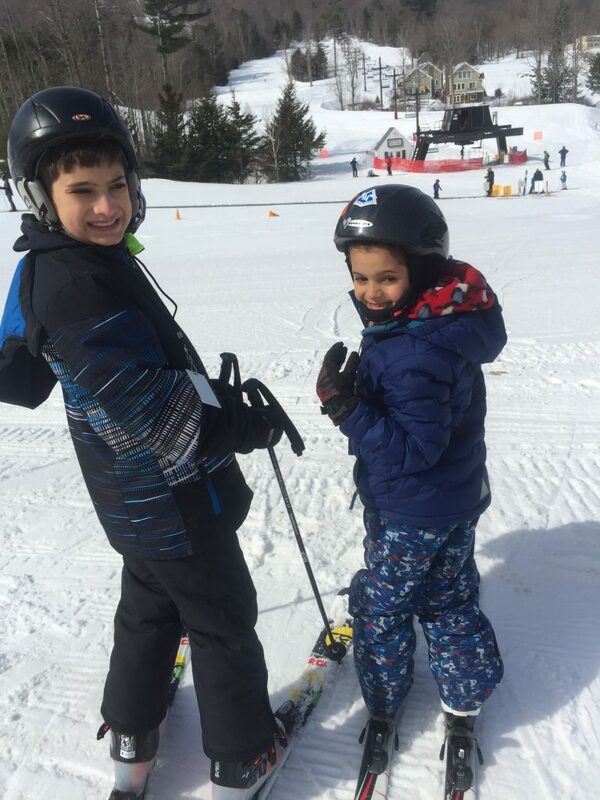 Two boys, ready to ski! Local mountains will also offer great deals on season passes if you buy them at the end of a season. For example, in March of this year, when the season is winding down, season passes will be on sale for anywhere from 25-50% off, maybe more. Mountains want skiers to buy while they’re still remembering the fun of this season. If we’ve had a really bad year with just a little snow (like last year), then those tickets are usually even more discounted, to encourage people to be optimistic for next season. 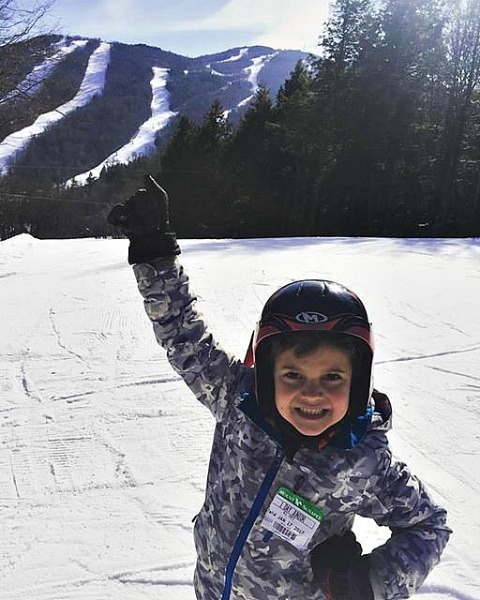 There are also some terrific deals if you keep your eyes and ears open: last year, a local Ski Lease shop, Zimmerman’s, offered a $99 season pass for all kids who leased gear through them. That is an incredible deal to ski all season long! Mountains offer deals if you ski on off days, as long as they’re non-holiday weeks. We usually take a day off during the season to utilize these deals. On Wednesdays, a big ski resort offers a two-for-one ski special. Two people can ski for the price of one lift ticket ($74). Tuesdays are Ladies Days, which offer a “Ski All Day” for $45 ticket (and $25 childcare) plus breakfast. 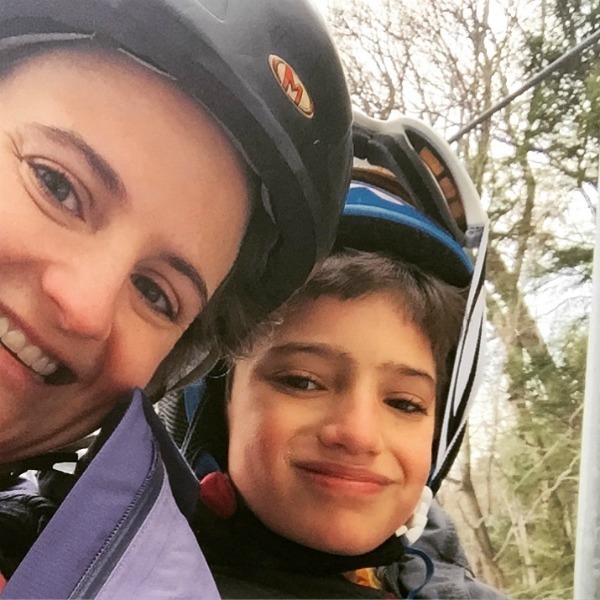 Many mountains have Ladies Days Specials, so that moms with kids can get out on the slopes with their friends. The most expensive time to ski is on weekends during the holidays. Slopes don’t want to offer any discounts because there are so many people trying to cram in a few days at the mountain during their vacations! We avoid these times like the plague. Not only are they expensive, they’re crowded. If you don’t have a ski resort in a day’s driving distance, like we do, then plan your vacations during a non-holiday (New Year’s, Winter Break, President’s Day Long Weekend, etc.) time. Another way to get gear for kids is lease programs. These are a little more expensive, but still a lot cheaper than rentals. For example, there was one lease program with a deal for $99/season boots, binding, and ski lease, with fitting and tune-up. You would get a pass booklet with the lease that offered free kids’ lift tickets with an adult purchase. The ski shop also offered you 40% off your tickets if you were a member of their free Frequent Shopper Club (you just sign up, much like a supermarket frequent buyer program). One local company has even offered a $99 season pass at a major mountain if you lease skis with them. Because your kids will probably outgrown their gear each year, this is a way they could ski all season long for less than $200, with gear included. Skiing is a great family activity. When we’re skiing, we could drop $25 on lunch or snacks at the Lodge, or, we could bring our own. I always pack sandwiches, fruit, chocolate covered pretzels, and hot chocolate in our Thermos. I put it right in my ski bag and leave it in the bag area. Then, when we go inside for lunch, it’s right there waiting on us, and we don’t have to wait in line. This trick has saved us a ton of money, because food at ski lodges is really pricey. It also saves us time, since lunch is already made and we don’t need to wait for it. One of my friends told me about a special deal she heard for a season pass for a local mountain for just $250. Another friend buys used skis and then has her friend tune them up for free. We’ve found that being on the lookout for deals and ideas to help us ski on the cheap is one of the best ways to save. When friends hear about a great deal or a good savings tip, they’ll pass it on. We also subscribe to local mountains’ newsletters to hear about upcoming events. This year, my parents gave the boys one $100 gift certificate each to ski. This was such a great gift. When they asked what the boys would like, I mentioned this as a top option. Instead of another toy that they’ll put together and break in a few weeks, a $100 gift certificate can be good for three to four trips to the mountain each, if we buy carefully. If you have family members that are looking for gift suggestions, the gift of experiences is one of our favorites. And it’s like three gifts in one: it’s fun to get the gift certificate, exciting to buy passes, and fun to use. Skiing is an expensive hobby, but with careful planning, it doesn’t have to be cost-prohibitive. Many families in our area buy season passes (when they’re on sale) and then ski with their families every single weekend. While we only ski about 4-5 times a season, it is something we love to do, so we make sure to find great deals so it doesn’t break the bank. What is your family’s favorite entertainment? How do you save money on it?